These are some of the staples from my closet and the pieces that I reach for most frequently. I call them my "go to" wardrobe. They are comfortable friends and are very versatile, blending with many different ensembles. When I reach for one of these treasures it is to create an overall appearance rather than match a color or style. Some of my jewelry customers like to pair their pieces. I am frequently asked "What kind of earrings go with this Necklace?" or "What should I wear with this bracelet?" ﻿﻿The first pair are made of copper. They are a traditional handcrafted love knot design, strung onto copper ear wires and oxidized to give them a wonderful patina. The love knots are 5/8 inch in diameter. They hang 3/4 inch from the hook of the ear wire. They are also available in a mixed metal design of sterling silver or nobium and copper for those whose ears are sensitive to base metals. I wear a pair of earrings in this design at least once a week to go to a meeting, to go out to a movie, or even to go to work in my scrubs. The latter pair are my personal favorites. The ear wires are long arches made of Vintaj natural brass which is nickle free for those with sensitive ears. 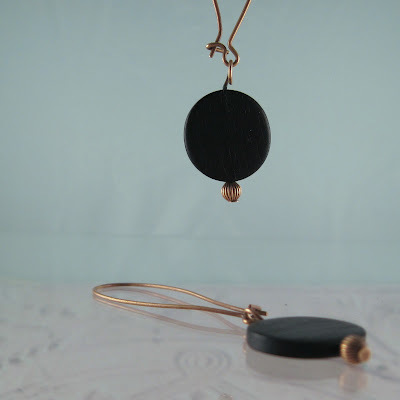 The black circle is polished wood making an earring that is comfortable and lightweight. The ear wires are 1 3/4 inches in length. The wood circles are 5/8 inch in diameter. That makes the total length 2 3/4 inch from the top of the ear wire to the bottom of the disk. 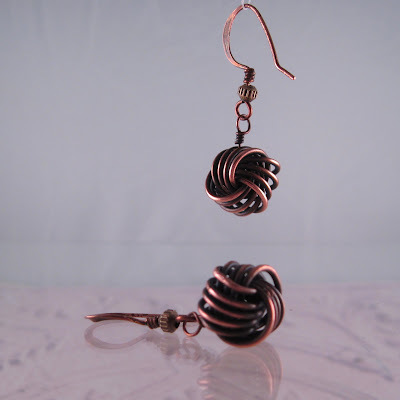 These are a great pair of earrings when you would like a little dangle. They have great movement when worn them but are subtle rather than glam for everyday use. What are the "go to" garments in your wardrobe? What do you wear them with?